The Shepherd Barn appears on the 1853 map of Northampton and some elements of its framing suggest that it may have been built soon after the house, which has been dated to 1797-1798. Henry Shepherd (1811-1900) and his son Thomas (1856-1923) were both horsemen, and the name of Thomas's horse, Br'er Fox, is still visible over the window to his stall. The barn probably also housed a light carriage or buggy as well as well as the extensive collection of garden tools that survives today. The Shepherds had flower gardens and a drive between the house and the barn, and they bought the plot of land directly behind in (now the parking lot) to allow for more extensive vegetable gardening. Thomas's letters to his wife Edith in 1916 describe growing asparagus, tomatoes and fruit trees. Today, the children of the Bridge Street School continue the gardening tradition on the Shepherd property. 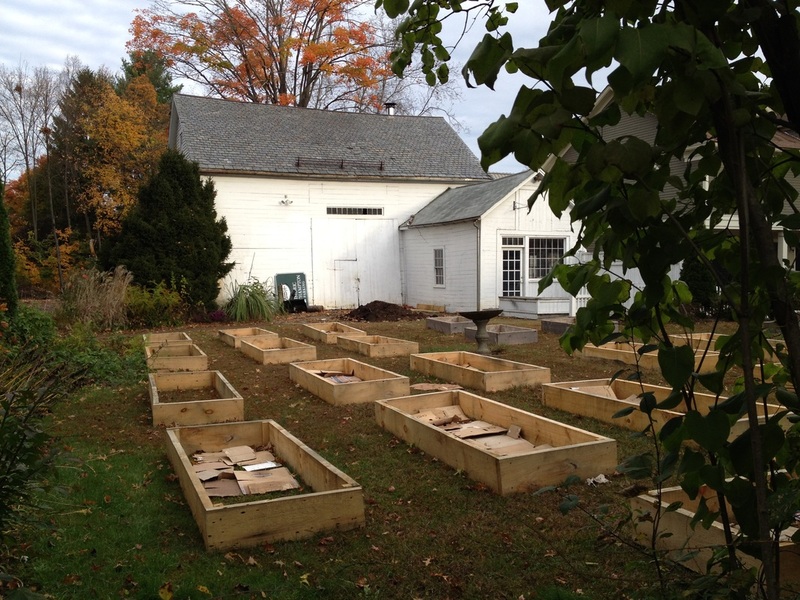 The photograph at the right shows their boxed beds just after they were installed in the fall of 2014. Through the Sprouts program, children are learning organic methods for growing vegetables.